Can artwork was done by Philadelphia artist Christina Hess. 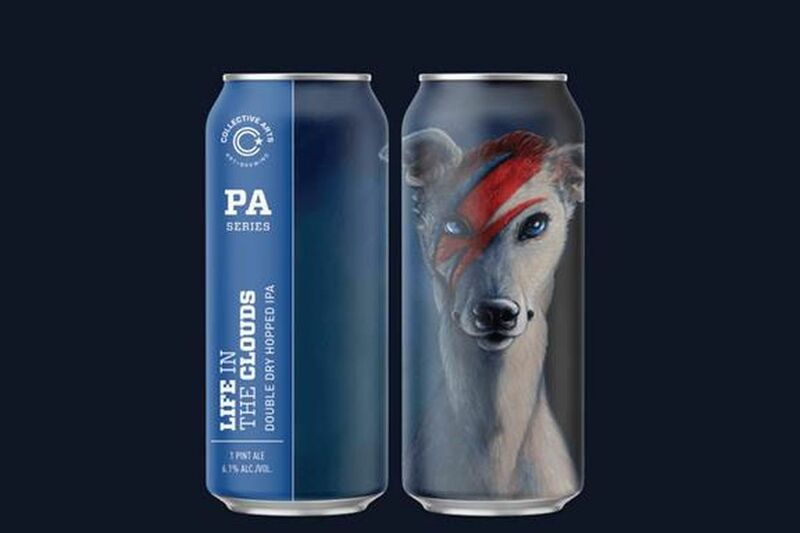 Our beer-loving neighbors to the north at Ontario’s Collective Arts Brewing are expanding their distribution to Pennsylvania next week with a series of special events in Philadelphia and Pittsburgh, plus a line of cans featuring work from local artists. The Hamilton, Ontario-based brewery has partnered with 31st and Wharton to bring their beers to the Philadelphia area starting March 11, according to a release. Initially on offer will be draft and cans of some of the company’s core beers, including Stranger Than Fiction Porter, Ransack the Universe IPA, Life in the Clouds IPA, and Jam Up the Mash Dry Hopped Sour, plus some rotating, small-batch brews. Founded in 2013 by Johnston and partner Bob Russell, Collective Arts describes itself as a “grassroots” brewery, and focuses especially on collaborations with musicians and visual artists. As Johnston says, Collective Arts typically does a global call for art every three months, after which they curate selections into a series and alternate the pieces as their can art throughout the year. Through those collaborations, the brewery got connected with local artists like illustrator Christina Hess, one of four Philly-bases creators featured for Collective Arts’ local launch. Additional artists have not yet been announced, and a spokesperson did not respond to request for comment. To celebrate coming to Pennsylvania, Collective Arts will hold a series of events to introduce their beers to the area starting March 10 with a “spin your own vinyl night” at Prohibition Taproom. From there events throughout the week at locations such as the Pub on Passyunk East, Pinnochio’s in Media, Delaware County, and Garage Fishtown, among other spots. A full list of events is available on Collective Arts’ website. Further local get-togethers, Johnston says, are in the works. Pennsylvania is the brewery’s latest area of expansion, which already includes US states such as Connecticut, New Hampshire, Massachusetts, Vermont, and New York. Collective Arts beers are also available internationally in countries including Canada (of course), the UK, and Sweden. In addition to expanding distribution, Collective Arts will begin entering in to the Canadian cannabis market with Collective Project Limited. Announced last month, the brewery’s sister company will create and sell cannabis and CBD-infused beverages in Canada, where recreational marijuana recently was legalized. Johnston hopes to start selling those drinks, which could include nonalcoholic beer infused with THC and CBD, on the Canadian market in October, but he isn’t yet sure about distribution on Pennsylvania’s medical marijuana market. Marijuana-infused beverages or not, Johnston says he hopes Collective Arts can bring a little more beer-based creativity to the Philadelphia area, as well as the world generally. After all, he says, that could be a help to everybody.